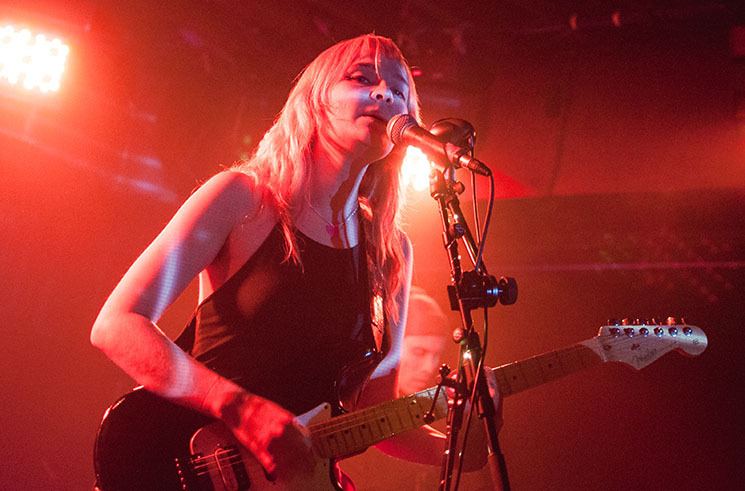 Fresh off the release of their third full-length record, Stuffed & Ready, Los Angeles-based Cherry Glazerr brought their bratty garage-punk to Toronto for a soldout Wednesday night show. Now a trio since the last time they played the Velvet Underground in 2017 (keyboardist Sasami Ashworth has departed), Cherry Glazerr have zeroed in on a tighter sound featuring heavier guitar work and bigger, more subversive choruses. Boston band Palehound, led by Ellen Kempner, started off the night with boisterous guitar licks on the scraggly "Room" and the unflinching "Flowing Over," from their overlooked 2017 album A Place I'll Always Go. Unfortunately, Kempner's growling whispers were sometimes lost in the booming mix, but were later spot-on for their slinking, murderous new song "Killer," which was released a few days ago. With giant inflatable cherries in the back, and some blinking, pokey sculptures around the stage, bandleader and guitarist-vocalist Clementine Creevy jaunted toward centre stage and began with "Ohio," the opening song on Stuffed & Ready. A venue-wide, squirming mosh pit really got going a few songs in for Creevy's "favourite song" to play, "Self Explained," especially for the crunchy breakdown toward the end. The crowd got even wilder for "Nurse Ratched," from 2017's Apocalipstick, and the malicious "White's Not My Color This Evening," from their debut, Haxel Princess. Creevy started Cherry Glazerr when she was a teenager, and since then the project has seen several different lineup iterations as Creevy has grown into a more confident songwriter, tackling topics such as her own insecurities and the imbalance of power dynamics for women. These issues were addressed head-on with a sarcastic and cynical tone on Stuffed & Ready, singles "Daddi" and "Wasted Nun," both of which conjured up a chaotic reaction from the sweat-drenched crowd. On Cherry Glazerr's studio albums, Creevy's vocals range from sweet and dreamy to occasional bursts of pouty shrieks and goofy cackles, but she does not quite have the same dynamic punch in a live setting, and her usual cheeky singing style was toned down more than expected. Creevy made up for it with her snarky charisma and ferociously meaty guitar riffage, which seemed to ooze onto the front row as she pranced around the stage. Creevy showed off some major shredding on the "metal version" of "Teenage Girl," and even more so on the double whammy ending of Apocalipstick's title track and "Sip O' Poison," where drummer Tabor Allen and bassist Devin O'Brien pummelled out the explosive backbeat with no shits given. For the encore, Cherry Glazerr came back out to cover a faithful version of LCD Soundsystem's "Time to Get Away," sort of an odd choice seeing as most of the crowd seemed not to know the song, but nevertheless was surprisingly pulled off very sleekly. Before heading out, Creevy started the snappy riff from fan favourite "Told You I'd Be with the Guys," an empowering, bombastic song, perfect for one last perspiring hurrah.